NEW YORK – Archbishop Demetrios of America made a five-day trip to Constantinople and Athens. He arrived in Phanar on Friday, April 23 – the feast of the St. George the Trophybearer – in order for his visit to coincide with the visit of His Beatitude Theophilos III, Patriarch of Jerusalem to the Ecumenical Patriarchate. The next day, the Archbishop was present at the official welcome of the Patriarch of Jerusalem and his delegation of Hierarchs and clergy who had come from the Holy Land for the re-opening of the Jerusalem Patriarchal Metochion of St. George in Neochori. After the formal reception of His Beatitude, the Archbishop participated in a meeting with the two Patriarchs and other Hierarchs aiming at a final resolution of pending issues related to the Palestinian-Jordanian communities in the United States, which concluded successfully. On Sunday, April 25, the Archbishop attended the Divine Liturgy with His All Holiness. The Liturgy was celebrated by the Patriarch of Jerusalem and his synodia in the Metochion of St. George. In the afternoon, Ecumenical Patriarch Bartholomew in a special meeting with the Archbishop reviewed the arrangements for the forthcoming Episcopal Assembly of North and Central America. The next day, the Archbishop traveled to Athens. On Tuesday April 26, the Archbishop visited in succession His Beatitude Archbishop Ieronymos of Athens and All Greece, Prime Minister George Papandreou, Alternate Minister of Foreign Affairs Dimitris Droutsas, and Foreign Affairs Chief of Protocol Ambassador Aikaterini Boura (formerly the Consul General in New York). In all the above cases the Archbishop had substantive discussions concerning Greece and the Omogeneia in the U.S. The Archbishop, during the same day, also had two meetings with the advance teams that prepare Ionian Village for the summer sessions. Upon his arrival in New York yesterday, Archbishop Demetrios was informed about some false reports in the Media referring to information of a supposed resignation. His Eminence stated categorically that the reports were baseless and patently false. The Archbishop further added that there is no discussion about any resignation whatsoever. 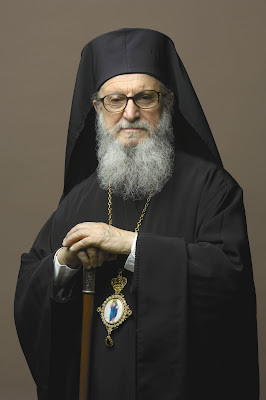 He said that he is looking forward in the coming years to the continuation of the sacred and vital mission and work of the Holy Greek Orthodox Archdiocese of America, with the same faith, zeal, methodical planning and love, especially in view of the difficulties confronting our contemporary world.